For other uses, see High Line (disambiguation). The High Line is a 1.45-mile-long (2.33 km) elevated linear park, greenway and rail trail created on a former New York Central Railroad spur on the west side of Manhattan in New York City. The High Line’s design is a collaboration between James Corner Field Operations (Project Lead), Diller Scofidio + Renfro, and Piet Oudolf. The abandoned spur has been redesigned as a "living system" drawing from multiple disciplines which include landscape architecture, urban design, and ecology. Since opening in 2009, the High Line has become an icon of contemporary landscape architecture. The High Line at West 20th Street, looking south. The vegetation was chosen to acknowledge the wild plants which had colonized the abandoned railway before it was repurposed. The park is built on a disused, southern viaduct section of the New York Central Railroad line known as the West Side Line. Originating in the Lower West Side of Manhattan, the park runs from Gansevoort Street – three blocks below 14th Street, in the Meatpacking District – through Chelsea to the northern edge of the West Side Yard on 34th Street near the Javits Center. The West Side Line formerly extended south to a railroad terminal at Spring Street, just north of Canal Street, and north to 35th Street at the site of the Javits Center. Most of the viaduct's southern section was demolished in 1960, and the section north of 34th Street was demolished and reconfigured in 1981. Another small portion from Bank to Gansevoort Streets was demolished in 1991. The High Line was inspired by the 3-mile-long (4.8 km) Promenade plantée (tree-lined walkway), a similar project in Paris which was completed in 1993. Because of declining usage, the railway viaduct was effectively abandoned in 1980. Repurposing the railway into an urban park began in 2006, with the first phase opening in 2009 and the second phase opening in 2011. The third and final phase opened to the public on September 21, 2014. A short stub above Tenth Avenue and 30th Street was scheduled to open by 2018, then in April 2019, but as of April 2019[update], was expected to open in June 2019. The High Line's success has inspired cities throughout the United States to redevelop obsolete infrastructure as public space. The project has spurred real estate development in adjacent neighborhoods, increasing real-estate values and prices along the route in an example of the halo effect. As of September 2014, the park had nearly five million visitors annually. The park extends from Gansevoort Street to 34th Street. At 30th Street the elevated tracks turn west around the Hudson Yards Redevelopment Project to the Jacob K. Javits Convention Center on 34th Street, although the northern section is expected to be integrated with the Hudson Yards development and the Hudson Park and Boulevard. When the Hudson Yards Redevelopment Project's Western Rail Yard is finished in 2018 it will be elevated above the High Line Park, so an exit along the viaduct over the West Side Yard will lead to the Western Rail Yard. The 34th Street entrance is at grade, with wheelchair access. The park is open daily from 7 a.m. to 7 p.m. in winter, until 10 p.m. in spring and fall, and until 11 p.m. in summer (except for the Interim Walkway west of 11th Avenue, which is open until dusk). It can be reached through eleven entrances, five of which are accessible to people with disabilities. The wheelchair-accessible entrances, each with stairs and an elevator, are at Gansevoort, 14th, 16th, 23rd, and 30th Streets. Additional staircase-only entrances are located at 18th, 20th, 26th, and 28th Streets, and 11th Avenue. Street-level access is available at 34th Street via the Interim Walkway, which runs from 30th Street and 11th Avenue to 34th Street west of 11th Avenue. At the Gansevoort Street end (which runs north-south), the stub over Gansevoort Street is named the Tiffany and Co. Foundation Overlook and was dedicated in July 2012; the foundation was a major supporter of the park. The route then passes under The Standard, High Line hotel and through a passage at 14th Street. At 14th Street, the High Line splits into two sides at different elevations; the Diller-Von Furstenberg Water Feature (opened in 2010) is on the lower side, and a sundeck is on the upper side. The route passes under the Chelsea Market, a food hall, at 15th Street. A spur, connecting the viaduct to the National Biscuit Company building and closed to the public, splits off at 16th Street. The Tenth Avenue Square, an amphitheater on the viaduct, is at 17th Street where the High Line crosses over Tenth Avenue from southeast to northwest. At the 23rd Street Lawn, visitors can rest. Between 25th and 26th Streets a ramp takes visitors above the viaduct, with a scenic overlook facing east at 26th Street. The Philip Falcone and Lisa Maria Falcone Flyover, named after two major donors to the park, was based on plans for a Phase 1 flyover which was never built. The park then curves west to Phase 3 and merges into the Tenth Avenue Spur, which stretches over 30th Street to Tenth Avenue. Phase 3 has another ramp taking visitors above the viaduct at 11th Avenue and a play area with rail ties and the Pershing Beams (modified, silicone-covered beams and stanchions coming out of the structure), a gathering space with benches, and a set of three railroad tracks where one can walk between the rails. The play area also has a seesaw-like bench and a "chime bench", with keys which make sounds when tapped. The Interim Walkway, from 11th Avenue and 30th Street to 34th Street divides the viaduct into two sides: a gravel walkway and an undeveloped section with rail tracks. The temporary walkway will close for renovation when the Tenth Avenue Spur is completed. The High Line turns north to a point just east of Twelfth Avenue. At 34th Street it curves east and descends, ending at street level midway between 12th and 11th Avenues. The square at Tenth Avenue and 17th Street, where the "10th Avenue Square & Overlook" provides views of the street from a window placed in the space created by removing the structure's steel beams. The park's attractions include naturalized plantings, inspired by plants which grew on the disused tracks, and views of the city and the Hudson River. The pebble-dash concrete walkways swell and constrict, swing from side to side, and divide into concrete tines which meld the hardscape with plantings embedded in railroad-gravel mulch. "By opening the paving, we allow the plants to bleed through," said landscape architect James Corner, "almost as if the plants were colonizing the paved areas. There's a sort of blending or bleeding or suturing between the hard paving, the surface for people to stroll on, and the planting ... " Stretches of track and ties recall the High Line's former use, and portions of track are re-used for rolling lounges positioned for river views. The 120-species plant palette, curated by Dutch landscape architect Piet Oudolf, includes sturdy meadow plants (such as clump-forming grasses, liatris, and coneflowers) and scattered stands of sumac and smokebush and is not limited to native plants. At the Gansevoort Street end, a grove of mixed species of birch provides shade by late afternoon. Ipê timber for the built-in benches came from a managed forest certified by the Forest Stewardship Council to ensure sustainability and the conservation of biological diversity, water resources, and fragile ecosystems. According to James Corner Field Operations, the High Line's design "is characterized by an intimate choreography of movement." The High Line also has cultural attractions as part of a long-term plan for the park to host temporary installations and performances. Creative Time, Friends of the High Line, and the New York City Department of Parks and Recreation commissioned The River That Flows Both Ways by Spencer Finch as the inaugural art installation. The work is integrated into the window bays of the former Nabisco factory loading dock as a series of 700 purple and gray glass panes. Each color is calibrated to match the center pixel of 700 digital pictures (one taken every minute) of the Hudson River, making up an extended portrait of the river. Creative Time worked with Finch to realize his site-specific concept after he saw the rusted, disused mullions of the old factory, with metal-and-glass specialists Jaroff Design helping to prepare and reinstall. A summer 2010 sound installation by Stephen Vitiello was composed from bells heard throughout New York. Lauren Ross, former director of the alternative art space White Columns, was the High Line's first curator. During the construction of the second phase (between 20th and 30th Streets) several artworks were installed, including Sarah Sze's Still Life with Landscape (Model for a Habitat): a steel-and-wood sculpture near 20th and 21st Streets built as a house for fauna such as birds and butterflies. Kim Beck's Space Available was installed on the roofs of three buildings visible from the southern end. Three 20-by-12-foot (6.1 by 3.7 m) sculptures, resembling the armature of empty billboards and constructed like theater backdrops, looks three-dimensional from a distance. Also installed during the second phase of construction was Julianne Swartz's Digital Empathy, a work utilizing audio messages at restrooms, elevators, and water fountains. In 2012-13 the Ghanian born Nigerian artist El Anatsui's large scale sculpture "Broken Bridge ll" (at the time his largest work to date) fashioned from recycled pressed tin and broken mirrors was positioned on a wall on the west side of the street between West 21st and West 22nd street facing and sidelining the High Line. In 2016 Tony Matelli's controversial sculpture "Sleepwalker" was exhibited upon the High Line. In 2017 Max Hooper Schneider's aquarium was displayed on the passageway. In 2018 the High Line hosted the British sculptor Phyllida Barlow's first public commission "Prop" which has been described as a concrete colossus. Train passing underneath the Bell Laboratories Building, seen from Washington Street in 1936. Only the track segment underneath the building still exists. In 1847, the City of New York authorized the construction of railroad tracks along Tenth and Eleventh Avenues on Manhattan's West Side. The street-level tracks were used by the New York Central Railroad's freight trains, which shipped commodities such as coal, dairy products and beef. For safety the railroad hired "West Side cowboys", men who rode horses and waved flags in front of the trains. However, so many accidents occurred between freight trains and other traffic that the nickname "Death Avenue" was given to Tenth and Eleventh Avenues. In 1910, one organization estimated that there had been 548 deaths and 1,574 injuries over the years along Eleventh Avenue. Public debate about the hazard began during the early 1900s. In 1929 the city, the state, and New York Central agreed on the West Side Improvement Project, conceived by Robert Moses. The 13-mile (21 km) project eliminated 105 street-level railroad crossings and added 32 acres (13 ha) to Riverside Park; it also included construction of the West Side Elevated Highway. It cost more than $150 million, worth about $2.19 billion in 2018 dollars. The last stretch of street-level track was removed from Eleventh Avenue in 1941. The first train on the High Line viaduct, part of New York Central's West Side Line, ran along the structure in 1933. The elevated structure was dedicated on June 29, 1934, and was the first part of the West Side Improvement Project to be completed. The High Line, which originally ran from 35th Street to St. John's Park Terminal at Spring Street, was designed to go through the center of blocks rather than over an avenue; as a result, the viaduct's construction necessitated the demolition of 640 buildings. It connected directly to factories and warehouses, allowing trains to load and unload inside buildings. Milk, meat, produce, and raw and manufactured goods could be transported and unloaded without disturbing street traffic. This reduced the load on the Bell Laboratories Building (which has housed the Westbeth Artists Community since 1970) and the former Nabisco plant in Chelsea Market, which were served from protected sidings in the buildings. Phase 3 section, looking west in 2009. The line climbs along the south side of 34th Street and curves south. The line also passed under the Western Electric complex at Washington Street. Although the section still existed in May 2008, it is not connected to the developed park. The growth of interstate trucking during the 1950s led to a drop in rail traffic throughout the U.S. Around 1960, the southernmost section of the line was demolished, both due to low use and so the West Village Apartments could be built on part of the former segment's right of way. This section began at Bank Street and ran down Washington Street to Spring Street (just north of Canal Street). By 1978, the High Line viaduct was used to deliver two carloads of cargo per week. In 1980, the High Line's owner Conrail had to disconnect the viaduct from the rest of the national rail system for a year. The closure was necessitated as a result of the construction of Javits Center at 34th Street, which required that the curve at 35th Street be rebuilt. The last train on the viaduct was a three-car consist carrying frozen turkeys. During the time the viaduct was disconnected, two large customers along the route moved to New Jersey. The curve to the viaduct from 35th Street was demolished during the construction of Javits Center and was replaced by the current curve at 34th Street. The tracks leading to the High Line were reconnected in 1981, but as there were no more customers along the route, the curve at 34th Street was never completed, and the viaduct did not see any further usage. At this point, Conrail still owned the right of way and the tracks. During the mid-1980s, a group of property owners with land under the line lobbied for the demolition of the entire structure. Peter Obletz, a Chelsea resident, activist, and railroad enthusiast, challenged the demolition efforts in court and tried to re-establish rail service on the line. Obletz offered to buy the viaduct for $10 in order to run a small amount of freight trains on the line, and Conrail accepted, mainly because demolition would have cost $5 million. However, this offer was also disputed in court. By 1988, the Metropolitan Transportation Authority was negotiating with Conrail for the possibility for using the line's right of way to construct a light rail route. These negotiations did not proceed further, and by the end of the 1980s, it was expected that the High Line would be demolished. As part of the construction of the Empire Connection to Penn Station, which opened in spring 1991, the West Side Line tracks north of 35th Street were routed to the new Empire Connection tunnel to Penn Station. A small section of the High Line in the West Village, from Bank to Gansevoort Streets, was taken apart in 1991 despite objections by preservationists. The line was unused and in disrepair during the 1990s, but the riveted-steel elevated structure was structurally sound. Around this time, it became known to urban explorers and local residents for the tough, drought-tolerant wild grasses, shrubs (such as sumac) and rugged trees which had sprung up in the gravel along the abandoned railway. The administration of mayor Rudy Giuliani planned to demolish the structure. The nonprofit organization Friends of the High Line was formed in 1999 by Joshua David and Robert Hammond, residents of the neighborhood through which the line ran. They advocated its preservation and reuse as public open space, an elevated park or greenway similar to the Promenade Plantée in Paris. The organization was initially a small community group advocating the High Line’s preservation and transformation when the structure was threatened with demolition during Rudy Giuliani’s second term as mayor. CSX Transportation, which owned the line, had given photographer Joel Sternfeld permission to photograph it for a year. Sternfeld's photographs of its meadow-like natural beauty, discussed in an episode of the documentary series Great Museums, were used at public meetings when the subject of saving the High Line was discussed. Fashion designer Diane von Fürstenberg (who had moved her New York City headquarters to the Meatpacking District in 1997) and her husband, Barry Diller, organized fundraising events in her studio. Community support for redevelopment of the High Line for pedestrian use grew, and in 2004 the New York City government committed $50 million to establish the proposed park. Mayor Michael Bloomberg and City Council speakers Gifford Miller and Christine C. Quinn were notable supporters. Funders of the High Line park raised a total of over $150 million (equivalent to $175,174,000 in 2018). The High Line runs under the Standard Hotel. The federal Surface Transportation Board issued a certificate of interim trail use on June 13, 2005, allowing the city to remove most of the line from the national rail system. On April 10, 2006, Mayor Bloomberg presided over a ceremony to mark the beginning of construction. The park was designed by James Corner's New York-based landscape architecture firm Field Operations and architects Diller Scofidio + Renfro, with garden design by Piet Oudolf of the Netherlands, lighting design from L'Observatoire International, and engineering design by Buro Happold and Robert Silman Associates. New York City Department of City Planning director and city planning commission chair Amanda Burden contributed to the project's development. Major supporters included Philip Falcone, Diane von Fürstenberg, Barry Diller and von Fürstenberg's children, Alexander and Tatiana. Hotel developer Andre Balazs, owner of the Chateau Marmont in Los Angeles, built the 337-room Standard Hotel straddling the High Line at West 13th Street. The southernmost section, from Gansevoort Street to 20th Street, opened as a city park on June 8, 2009. The section includes five stairways and elevators at 14th Street and 16th Street. Around the same time, construction of the second section began. A ribbon-cutting ceremony was held on June 7, 2011 to open the second section (from 20th Street to 30th Street), with Mayor Michael Bloomberg, New York City Council speaker Christine Quinn, Manhattan Borough President Scott Stringer and Congressman Jerrold Nadler in attendance. CSX Transportation, owner of the northernmost section from 30th to 34th Streets, agreed in principle to donate the section to the city in 2011; the Related Companies, which owns development rights for the West Side Rail Yards, agreed not to tear down the spur crossing 10th Avenue. Construction on the final section was started in September 2012. The Whitney Museum of American Art opened its new building on Gansevoort Street, next to the base of the High Line, in 2015. A ribbon-cutting ceremony for the High Line was held on September 20, 2014, followed the next day by the opening of its third section and a procession down the line. The third phase, costing $76 million, was divided into two parts. The first part (costing $75 million) is from the end of phase 2 of the line to its terminus at 34th Street, west of 11th Avenue. The second part, the spur, has room to install artworks curated by the public art program. It will be integrated with 10 Hudson Yards (which has been built over the spur), and will include a plinth when it opens in 2019. The line is maintained by Friends of the High Line, which was founded by area residents Joshua David and Robert Hammond in 1999. The organization is credited with saving the structure by rallying public support for the park and convincing Mayor Michael Bloomberg’s administration in 2002 to support the project by filing a request with the Surface Transportation Board to create a public trail on the site. Friends of the High Line played a role in the line's visual aesthetic, holding a competition in conjunction with the city of New York in 2004 to determine the design team which would lead the project. Since the park's opening in 2009, Friends of the High Line has had an agreement with the New York City Department of Parks & Recreation to serve as its primary steward. The organization is responsible for the daily operation and maintenance of the park, with an annual budget of over $5 million. It has an annual operating budget of $11.5 million, in addition to capital construction and management and fundraising expenses. Friends of the High Line has raised more than $150 million in public and private funds toward the construction of the first two sections of the park. Unlike the first two phases, to which the city significantly contributed, Friends of the High Line was responsible for raising funds for phase three (an estimated $35 million). The organization raises over 90 percent of the High Line's annual operating budget from private donations. A 2012 donation of $5 million from the city was controversial because the High Line received more funding that year than most city parks, although Friends of the High Line raised an extra $85 million that year. The organization has an office on Washington Street, near the park's southern end. It has 80 full-time, year-round employees and about 150 full-time summer employees. Friends of the High Line has been run by president and co-founder Josh David after executive director Jenny Gersten stepped down in 2014. Co-founder Robert Hammond served as executive director until he stepped down in February 2013. Friends of the High Line has a 38-member board of directors consisting of many New York City businesspeople and philanthropists, including Amanda Burden of Bloomberg Associates, Jane Lauder of Estée Lauder Companies, Jon Stryker of the Arcus Foundation and Darren Walker of the Ford Foundation. The recycling of the rail line into an urban park has revitalized Chelsea, which was "gritty" and in generally poor condition during the late twentieth century. It has also spurred real-estate development in the neighborhoods along the line. According to Mayor Bloomberg, the High Line project has helped usher in a renaissance of sorts in the neighborhood; by 2009 more than 30 projects were planned or under construction nearby, and by 2016 more than 11 projects were under construction. It has also helped raise the value of properties directly adjacent to the High Line by an average of 10 percent over properties a few blocks away. At least 20 properties abutting the High Line have sold for at least $10 million since the park's opening in 2009, with an apartment in a building directly adjacent to the park selling for an average of $6 million. Apartments located near Phase 1 of the High Line are, on average, more than twice as costly as those between Seventh and Eighth Avenues (two blocks east). In August 2016, the park continued to increase real-estate values along it in an example of the halo effect. Residents who have bought apartments next to the High Line have adapted to its presence in various ways, but most responses are positive; however, some say that the park has become a "tourist-clogged catwalk" since it opened. The real-estate boom has not been victimless; many established businesses in west Chelsea have closed due to loss of their neighborhood customer base or rent increases. Chelsea has significant minority communities, many of whom live in two large public housing developments. In a 2017 interview, Friends of the High Line co-founder Robert Hammond said that he "failed" the community; the High Line did not fulfill its original purpose of serving the surrounding neighborhood, which had become demographically divided around the park. Crime has been low in the park. Shortly after the second section opened in 2011, The New York Times reported that there had been no reports of major crimes (such as assault or robbery) since the first phase opened two years earlier. Parks Enforcement Patrols have written summonses for infractions of park rules such as walking dogs or riding bicycles on the walkway at a lower rate than in Central Park. Park advocates attributed this to the visibility of the High Line from surrounding buildings, a feature of urban life espoused by author Jane Jacobs nearly fifty years before. According to Joshua David, "Empty parks are dangerous ... Busy parks are much less so. You're virtually never alone on the High Line." In a review of the Highliner restaurant – which has now reverted to its previous name, the Empire Diner – Ariel Levy wrote in The New Yorker that... "The new Chelsea that is emerging on weekends as visitors flood the elevated park ... [is] touristy, overpriced, and shiny." Due to the High Line's popularity, there have been several proposals for museums along its path. The Dia Art Foundation considered (but rejected) a proposal to build a museum at the Gansevoort Street terminus. On that site, the Whitney Museum has built a new home for its collection of American art. The building, designed by Renzo Piano, opened on May 1, 2015. The High Line's success in New York City has encouraged leaders in other cities such as Chicago mayor Rahm Emanuel, who sees it as "a symbol and catalyst" for gentrifying neighborhoods. Several cities nationwide have plans to renovate railroad infrastructure into parkland, including Philadelphia's Rail Park, Atlanta's Belt Line, and Chicago's Bloomingdale Trail. The High Line has helped pioneer the creation of elevated parks worldwide. In Queens, the Queensway (a proposed aerial rail trail) is being considered for reactivation along the right-of-way of the former Long Island Rail Road Rockaway Beach Branch. Other cities around the world are planning elevated rails-to-trails parks in what a writer has called the "High Line effect". According to some estimates, it costs substantially less to redevelop an abandoned urban rail line into a linear park than to demolish it. Landscape architect James Corner (who led the High Line's design team) noted that "The High Line is not easily replicable in other cities," however, observing that building a "cool park" requires a "framework" of neighborhoods around it to succeed. In 2016, Friends of the High Line launched the High Line Network to support similar infrastructure re-use projects being developed in other cities. There are currently 19 projects in the network, including River LA, the Atlanta Beltline, Crissy Field, Dequindre Cut, the Lowline, Klyde Warren Park, the Bentway and the Trinity River Project. The line has been depicted in a variety of media before and after its redevelopment. The 1979 film Manhattan includes a shot of the High Line as director and star Woody Allen speaks the first line: "Chapter One. He adored New York City." Director Zbigniew Rybczyński shot the music video for Art of Noise's single, "Close (to the Edit)" on the line in 1984. In 2001 (two years after the formation of the Friends of the High Line), photographer Joel Sternfeld documented the High Line's flora and dilapidation in his book, Walking the High Line. The book also contains essays by writer Adam Gopnik and historian John R. Stilgoe. Sternfeld's work was regularly discussed and exhibited during the 2000s as the rehabilitation project developed. Alan Weisman's 2007 book, The World Without Us, cites the High Line as an example of the reappearance of the wild in an abandoned area. That year, chase scenes from the zombie apocalypse film I Am Legend were filmed there and in the Meatpacking District. Kinetics & One Love's 2009 song, "The High Line", uses the line (before its conversion to a park) as an example of nature's reclamation of man-made structures. A number of films and television programs have utilized the High Line since the park opened. In 2011, the television series Louie used it as a setting for one of the title character's dates. Other works with scenes on the High Line since its conversion include the HBO series Girls, the Simpsons episode "Moonshine River" and the film, What Maisie Knew. ^ a b c F. Green and C. Letsch (September 21, 2014). "New High Line section opens, extending the park to 34th St". Daily News. Archived from the original on September 21, 2014. Retrieved September 21, 2014. ^ a b c Geiger, Daniel (September 21, 2014). "High Line's high returns". Crain's New York. Archived from the original on March 28, 2017. Retrieved September 21, 2014. ^ a b Keller, Jared (July 2011). "First Drafts: James Corner's High Line Park". The Atlantic. Archived from the original on July 13, 2016. Retrieved June 5, 2017. ^ a b c d e f g h i j k l "High Line Map" (PDF). Friends of the High Line. Archived from the original (PDF) on June 27, 2014. Retrieved May 12, 2014. ^ a b "The High Line". NYC Architecture. Archived from the original on May 21, 2013. ^ a b c Greenstein, J (April 1, 2002). "WEST SIDE STORY : THE RISE AND FALL OF MANHATTAN'S HIGH LINE". Trains. 62 (3). ISSN 0041-0934. Retrieved July 10, 2018. ^ a b Dunlap, David W. (January 15, 1991). "Elevated Freight Line Being Razed Amid Protests". The New York Times. Archived from the original on September 11, 2014. Retrieved October 23, 2014. ^ a b "The Business of The High Line". Inc. October 2011. Retrieved September 5, 2012. ^ a b "High Line". BuroHappold Engineering. Archived from the original on September 11, 2014. Retrieved November 27, 2009. ^ a b c Pogrebin, Robin (June 8, 2009). "First Phase of High Line Is Ready for Strolling". The New York Times. Archived from the original on September 11, 2014. Retrieved July 8, 2009. ^ a b Pesce, Nicole Lyn (June 7, 2011). "Hotly anticipated second section of the High Line opens, adding 10 blocks of elevated park space". Daily News. Archived from the original on June 9, 2011. Retrieved June 7, 2011. ^ a b c d "Third and Final Phase Opens". The New York Times. September 20, 2014. Archived from the original on September 20, 2014. Retrieved September 20, 2014. ^ a b Jessica Dailey (September 4, 2014). "Final Section of the High Line Will Open on September 21". Curbed. Archived from the original on September 12, 2015. Retrieved September 9, 2014. ^ a b "Inside The Spur, the new High Line park". am New York. February 28, 2019. Retrieved March 15, 2019. ^ "'Brick House' Is Installed at the High Line". The New York Times. April 4, 2019. Retrieved April 8, 2019. ^ "UNDERNEATH, OVERLOOKED". Landscape Architecture Magazine. February 28, 2017. Archived from the original on July 14, 2017. Retrieved June 5, 2017. ^ a b Gregor, Alison (August 10, 2010). "As a Park Runs Above, Deals Stir Below". The New York Times. Archived from the original on May 7, 2011. Retrieved February 10, 2011. ^ a b Pereira, Ivan (August 8, 2016). "High Line, higher prices: Housing $oars (sic.) near elevated park (print version); High Line spurs jump in nearby home prices: Streeteasy (online version)". AM New York. Archived from the original on September 11, 2014. Retrieved August 10, 2016. ^ Topousis, Tom (December 8, 2006). "Rail Shot at Prosperity". New York Post. Archived from the original on October 20, 2012. Retrieved August 2, 2009. ^ "10 Hudson Yards Building Plan". Hudson Yards Redevelopment Project. January 22, 2014. Archived from the original on December 16, 2013. Retrieved April 1, 2014. ^ a b c d "Hudson Yards Set to Alter Skyline, Transform Neighborhood". Chelsea Now. February 6, 2013. Archived from the original on July 24, 2014. Retrieved June 2, 2014. ^ "Park Information". Friends of the High Line. June 8, 2011. Archived from the original on September 21, 2014. Retrieved September 20, 2014. ^ Laylin, Tafline (July 24, 2012). "Mayor Bloomberg Cuts Ribbon on the High Line's Newly Renamed Tiffany & Co. Foundation Overlook". Inhabitat. Archived from the original on September 11, 2014. Retrieved September 21, 2014. ^ "The Tiffany and Co. Foundation Overlook Dedicated on the High Line". Tiffany and Co. Foundation. July 2012. Archived from the original on September 24, 2014. Retrieved September 21, 2014. ^ a b Ouroussoff, Nicolai (April 8, 2009). "Industrial Sleek (a Park Runs Through It)". The New York Times. Archived from the original on April 10, 2009. Retrieved April 9, 2009. ^ "Polshek Partnership". Emap Construct. Archived from the original on February 11, 2012. Retrieved April 25, 2013. ^ a b c d Walsh, Kevin (September 2011). "HIGH LINE 2011: Rail to trail opens from 20th to 30th Streets". Forgotten NY. Archived from the original on November 14, 2014. Retrieved September 21, 2014. ^ "New Water Feature Coming to the High Line". Friends of the High Line. April 22, 2010. Archived from the original on June 16, 2010. Retrieved September 21, 2014. ^ "About Chelsea Market", Chelsea Market website Archived October 24, 2016, at the Wayback Machine. Retrieved September 21, 2014. ^ a b Kurutz, Steven (August 1, 2012). "Close Quarters". The New York Times. Archived from the original on October 29, 2014. Retrieved August 17, 2014. ^ "More Room to Roam on the High Line". The New York Times. May 29, 2011. Archived from the original on August 24, 2017. Retrieved September 21, 2014. ^ Walsh, Kevin J. (October 2014). "LAST OF THE HIGH LINE, Chelsea". Forgotten NY. Archived from the original on November 29, 2014. Retrieved November 16, 2014. ^ Mullanney, Jeanette (October 23, 2014). "Exploring New Design Features at the Rail Yards". Friends of the High Line. Archived from the original on October 24, 2014. Retrieved October 23, 2014. ^ Rosenberg, Zoe (September 20, 2014). "Say Hello to High Line at the Rail Yards, the Park's Final Leg". Curbed. Archived from the original on September 11, 2014. Retrieved September 21, 2014. ^ Davidson, Justin (September 20, 2014). "The High Line's Last Section Opens Tomorrow, and Here's a First Look". New York. Archived from the original on September 20, 2014. Retrieved September 21, 2014. ^ "Planting Design". Friends of the High Line. Archived from the original on April 2, 2010. Retrieved August 2, 2009. ^ "Construction". Friends of the High Line. Archived from the original on March 28, 2010. Retrieved August 17, 2014. ^ "Wood on the High Line". Friends of the High Line. Archived from the original on October 28, 2009. Retrieved August 2, 2009. ^ fo. "Field Operations - project_details". www.fieldoperations.net. Archived from the original on January 3, 2017. Retrieved June 5, 2017. ^ Vogel, Carol (May 21, 2009). "Seeing the Hudson River Through 700 Windows". The New York Times. Archived from the original on September 11, 2014. Retrieved July 2, 2011. ^ "Exclusive | el Anatsui: "Broken Bridge II"". ^ Dobrzynski, Judith H. (May 21, 2009). "Taking the High Line: the art park that rivals MoMA". The Art Newspaper. Archived from the original on July 16, 2011. Retrieved July 2, 2011. ^ "High Line Art: Kim Beck, Space Available". artforum.com. Archived from the original on November 20, 2015. Retrieved February 27, 2016. ^ "Kim Beck Riffs on Meatpacking Ads With Empty Signs - News - Art in America". www.artinamericamagazine.com. Archived from the original on March 4, 2016. Retrieved February 27, 2016. ^ "BOMB Magazine — Friends of the High Line by Tabitha Piseno". bombmagazine.org. Archived from the original on March 4, 2016. Retrieved February 27, 2016. ^ Browne, Alex (June 7, 2011). "High Notes – New Art on the High Line". The New York Times. Archived from the original on June 10, 2011. Retrieved June 7, 2011. ^ "Broken Bridge II". High Line Art. November 21, 2012. Retrieved July 5, 2018. ^ "Exclusive - El Anatsui: "Broken Bridge II"". Art21 Magazine. February 8, 2013. Retrieved July 5, 2018. ^ "Controversial Statue Comes to the High Line". artnet News. January 7, 2016. Retrieved July 5, 2018. ^ "The Personal History Behind Artist Max Hooper Schneider's High Line Aquarium". ^ "Sculptor Phyllida Barlow's Concrete Colossus on Stilts Will Tower over Chelsea This Spring". March 14, 2018. ^ a b Gray, Christopher (May 18, 2008). "As High Line Park Rises, a Time Capsule Remains". The New York Times. Archived from the original on April 25, 2012. Retrieved June 11, 2011. ^ a b c Dunlap, David W. (February 18, 2015). "New York City Rail Crossings Carry a Deadly Past". The New York Times. ISSN 0362-4331. Retrieved February 12, 2018. ^ a b "The Highline: past and present". GeoWeb, Harvard University. May 13, 2010. Archived from the original on October 23, 2014. Retrieved October 23, 2014. ^ a b c d e f g h i j "High Line History". Friends of the High Line. Archived from the original on September 22, 2014. Retrieved August 2, 2009. ^ a b c d e f Amateau, Albert. "Newspaper was there at High Line's birth and now its rebirth". The Villager. 77 (48). Archived from the original on July 13, 2011. Retrieved August 12, 2011. ^ Iovine, Julie V. (June 23, 2009). "All Aboard the High Line". WSJ. Retrieved July 8, 2018. ^ a b c d e f Gray, Christopher (1988). "Streetscapes: The West Side Improvement; On the Lower West Side, Fate Of Old Rail Line Is Undecided". The New York Times. ISSN 0362-4331. Retrieved February 26, 2018. ^ "History". Chelsea Market. Archived from the original on July 9, 2010. Retrieved July 14, 2010. 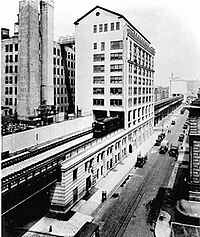 In 1932, the architect Louis Wirsching Jr. replaced some of the 1890 bakeries on the east side of 10th Avenue with the present unusual structure, which accommodates an elevated freight railroad viaduct. Its great open porch on the second and third floors was taken by the railroad as an easement for the rail tracks that still run through it. ^ a b c d Gottlieb, Martin (January 16, 1984). "Rail Fan Finds Rusting Dream of West Side". The New York Times. ISSN 0362-4331. Retrieved February 18, 2018. ^ "West Side Line & Selkurk Hurdle". Chris Whong. April 3, 2013. Archived from the original on April 7, 2014. Map of New York Central's West Side Line. ^ Freeman, John (May 13, 2007). "The Charming Gadfly Who Saved the High Line". The New York Times. Archived from the original on July 8, 2012. Retrieved August 12, 2011. ^ Voboril, Mary (March 26, 2005). "The Air Above Rail Yards Still Free". Newsday. New York. ^ Goldberger, Paul (May 15, 2012). "Miracle Above Manhattan". National Geographic. Archived from the original on August 26, 2014. Retrieved May 16, 2014. ^ "Q&A: Friends of the High Line interview". CNN. March 19, 2007. Archived from the original on September 11, 2014. Retrieved September 13, 2014. ^ Owen, Paul (November 18, 2008). "New York's historic elevated train line becomes a park". The Guardian. Archived from the original on August 29, 2014. Retrieved September 13, 2014. ^ a b c "The High Line". New York City Economic Development Corporation. Archived from the original on September 11, 2014. Retrieved May 19, 2015. ^ a b c Doyle, Chesney; Spann, Susan (2014). "Elevated Thinking: The High Line in New York City". Great Museums. ^ "Trail of the Month, October 2011". Rails-to-Trails Conservancy. Archived from the original on August 6, 2014. ^ Ponce, Leonel (June 27, 2011). "High Line Structural Engineering: Elevating the Design of New York's Preserved Rail". Inhabitat New York City. Archived from the original on March 4, 2012. Retrieved July 30, 2017. ^ Satow, Julie (May 20, 2012). "Amanda Burden, Planning Commissioner, Is Remaking New York City". The New York Times. Archived from the original on September 11, 2014. Retrieved July 30, 2017. ^ "Amanda Burden: How Can Public Spaces Change A City's Character?". NPR. January 8, 2016. Archived from the original on September 11, 2014. Retrieved July 30, 2017. ^ a b Taylor, Kate (November 1, 2011). "Coach Inc. Agrees to Occupy Third of Hudson Yards Tower". The New York Times. Archived from the original on November 3, 2011. Retrieved November 28, 2011. ^ Chan, Sewell (June 25, 2008). "High Line Designs Are Unveiled". The New York Times. Archived from the original on May 11, 2011. Retrieved August 12, 2011. ^ Marritz, Ilya (June 7, 2011). "As the High Line Grows, Business Falls in Love with a Public Park". WNYC. Archived from the original on June 9, 2011. Retrieved June 8, 2011. ^ Keith, Kelsey (November 1, 2011). "Third Section of High Line Is On The Docket, On Google Maps". Curbed. Archived from the original on January 8, 2012. Retrieved September 10, 2014. ^ Katz, Mathew (September 20, 2012). "High Line Begins Construction On Third And Final Section (PHOTOS)". Huffington Post. Archived from the original on September 11, 2014. Retrieved May 9, 2014. ^ "High Line at the Rail Yards". Friends of the High Line. Archived from the original on May 4, 2014. Retrieved May 12, 2014. ^ "Opening Ceremony Celebrates Completion Of High Line Park". CBS New York. September 20, 2014. Archived from the original on September 20, 2014. Retrieved September 21, 2014. ^ "Photos: High Line Phase Three is Officially Open". Gothamist. September 21, 2014. Archived from the original on September 23, 2014. Retrieved September 21, 2014. ^ Raver, Anne (September 3, 2014). "Upstairs, a Walk on the Wild Side". The New York Times. Archived from the original on September 10, 2014. Retrieved September 10, 2014. ^ "High Line at the Rail Yards Opening September 21". Friends of the High Line. September 4, 2014. Archived from the original on September 5, 2014. Retrieved September 4, 2014. ^ "The High Line's Final Section Will Open This Month". Gothamist. September 4, 2014. Archived from the original on September 7, 2014. Retrieved September 9, 2014. ^ Alberts, Hana R. (November 12, 2013). "Here Now, The Giant, Verdant Bowl In The Next High Line Phase - Rendering Reveals". Curbed. Archived from the original on September 11, 2014. Retrieved May 12, 2014. ^ Friends of the High Line (February 18, 2016). "New Design Concept for the Spur". Archived from the original on March 9, 2016. Retrieved March 8, 2016. ^ "High Line Park will be capped with a giant bowl theater". New York Daily News. Archived from the original on March 4, 2016. Retrieved February 18, 2016. ^ "10 Hudson Yards fact sheet" (PDF). Hudson Yards Redevelopment Project. Retrieved September 10, 2014. ^ Fedak, Nikolai (December 13, 2013). "Construction Update: 10 Hudson Yards". New York YIMBY. Archived from the original on September 11, 2014. Retrieved May 12, 2014. ^ Puglise, Nicole (April 18, 2017). "High art: New York's High Line to introduce new artwork plinth". The Guardian. Archived from the original on April 20, 2017. Retrieved April 18, 2017. ^ "Joshua David and Robert Hammond: Friends of the High Line". Interview Magazine. March 31, 2011. Archived from the original on July 7, 2015. Retrieved May 19, 2015. ^ a b "The High Line: NYC Parks". New York City Department of Parks and Recreation. Archived from the original on May 15, 2015. Retrieved May 19, 2015. ^ a b c Foderaro, Lisa W. (February 11, 2013). "Robert Hammond, Executive Director of Friends of the High Line, Will Step Down". The New York Times. ISSN 0362-4331. Archived from the original on July 15, 2016. Retrieved May 11, 2017. ^ a b Katz, Mathew (July 19, 2012). "Critics Question $5M City Donation to High Line Expansion". DNAinfo New York. Archived from the original on December 23, 2015. Retrieved May 11, 2017. ^ a b c "High Line Staff and Board". Friends of the High Line. Archived from the original on May 4, 2015. Retrieved May 19, 2015. ^ Foderaro, Lisa W. (September 2, 2014). "Executive Director Leaving Friends of the High Line". The New York Times. ISSN 0362-4331. Archived from the original on September 11, 2014. Retrieved May 11, 2017. ^ Koblin, John (April 2, 2007). "High Line Park Spurs Remaking Of Formerly Grotty Chelsea". New York Observer. Archived from the original on January 25, 2012. Retrieved August 12, 2011. ^ a b Barbanel, Josh (August 7, 2016). "The High Line's 'Halo Effect' on Property". The Wall Street Journal. ISSN 0099-9660. Archived from the original on August 7, 2016. Retrieved August 8, 2016. ^ Nonko, Emily (August 8, 2016). "Condos padding the High Line are ridiculously pricier than their neighbors". Curbed NY. Archived from the original on August 9, 2016. Retrieved August 8, 2016. ^ Moss, Jeremiah (August 21, 2012). "Disney World on the Hudson". The New York Times. Retrieved August 22, 2012. ^ Reichl, Alexander J. (August 17, 2016). "The High Line and the ideal of democratic public space". Urban Geography. 37 (6): 904–925. doi:10.1080/02723638.2016.1152843. ISSN 0272-3638. ^ Bliss, Laura (February 7, 2017). "The High Line's Biggest Issue—And How Its Creators Are Learning From Their Mistakes". CityLab. Archived from the original on February 21, 2017. Retrieved February 19, 2017. ^ Wilson, Michael (June 10, 2011). "The Park Is Elevated. Its Crime Rate Is Anything But". The New York Times. Archived from the original on June 14, 2011. Retrieved June 11, 2011. ^ Levy, Ariel (August 8, 2011). "The Highliner". The New Yorker. Archived from the original on August 26, 2014. Retrieved August 3, 2011. ^ Vogel, Carol (October 25, 2006). "Dia Art Foundation Calls Off Museum Project". The New York Times. Archived from the original on October 25, 2006. Retrieved July 8, 2009. ^ Smith, Roberta (April 30, 2015). "New Whitney Museum Signifies a Changing New York Art Scene". New York Times. Archived from the original on May 20, 2017. ^ a b c Shevory, Kristina (August 3, 2011). "Cities See the Other Side of the Tracks". The New York Times. Archived from the original on August 25, 2011. Retrieved August 3, 2011. ^ a b Taylor, Kate (July 14, 2010). "After Elevated Park's Success, Other Cities Look Up". The New York Times. ISSN 0362-4331. Archived from the original on September 27, 2015. Retrieved May 30, 2017. ^ Gastil, Ray (October 1, 2013). "Prospect parks: walking the Promenade Planteé and the High Line". Studies in the History of Gardens & Designed Landscapes. 33 (4): 280–289. doi:10.1080/14601176.2013.807650. ISSN 1460-1176. ^ "Photos: The Differing Destinies of Elevated Urban Parks". Archived from the original on September 30, 2015. Retrieved May 30, 2017. ^ Foderado, Lisa W. (January 7, 2013). "In Queens, Taking the High Line as a Model". The New York Times. Archived from the original on October 29, 2014. Retrieved October 23, 2014. ^ McGinn, Dave (October 1, 2014). "The High Line Effect: Why Cities Around The World (Including Toronto) Are Building Parks in the Sky". The Globe and Mail. Archived from the original on September 11, 2014. Retrieved October 24, 2014. ^ "High Line creators launch website to advise on avoiding gentrification". Dezeen. June 22, 2017. Archived from the original on July 11, 2017. Retrieved August 23, 2017. ^ "The High Line's Biggest Issue—And How Its Creators Are Learning From Their Mistakes". CityLab. Archived from the original on August 24, 2017. Retrieved August 23, 2017. ^ Marshall, Colin (August 15, 2017). "Want to join New York's High Line crowd? Don't listen to Joanna Lumley". The Guardian. ISSN 0261-3077. Archived from the original on August 23, 2017. Retrieved August 23, 2017. ^ Eldredge, Barbara (June 21, 2017). "High Line launches forum to advise similar projects around the country". Curbed. Archived from the original on August 24, 2017. Retrieved August 23, 2017. ^ Andrew Berman (May 23, 2011). "It Happened Here: 80s Music Videos". Greenwich Village Society for Historic Preservation. Archived from the original on September 10, 2014. Retrieved September 9, 2014. ^ Sternfeld, Joel; Stilgoe, John R.; Gopnik, Adam (2001). Walking the High Line. New York: Steidl/Pace/MacGill Gallery. ISBN 978-3-88243-726-3. ^ "The High Line Without Us". Friends of the High Line. Archived from the original on March 14, 2010. Retrieved September 9, 2014. ^ "I Am Legend film locations". The Worldwide Guide To Movie Locations. Archived from the original on September 10, 2014. Retrieved September 9, 2014. ^ a b Sheppard-Vaughn, Danette (March 5, 2013). "Tourism Tuesday Featuring New York City High Line". Royal Limos New York. Archived from the original on September 10, 2014. Retrieved September 9, 2014. ^ DeLucia, Greg (June 15, 2012). "The "Louie" Map of New York". Splitsider. Archived from the original on September 11, 2014. Retrieved September 9, 2014. ^ "'03: All Adventurous Women Do". HBO. Archived from the original on September 11, 2014. Retrieved September 9, 2014. ^ Wood, Megan (March 9, 2013). "A 'Girls' Guide to New York". NewYork.com. Archived from the original on September 10, 2014. Retrieved September 9, 2014. ^ Ty Burr (May 23, 2013). "'What Maisie Knew' invites us to see the world through her eyes". The Boston Globe. Archived from the original on September 11, 2014. Retrieved September 9, 2014. "Q&A: Friends of the High Line interview". CNN.com. March 19, 2007. David, Joshua; Hammond, Robert (2011). High Line: The Inside Story of New York City's Park in the Sky. New York: Farrar, Straus and Giroux. ISBN 978-0-374-53299-4. Davidson, Justin (June 7, 2009). "Elevated". New York. Maher, Michael (October 7, 2011). "Millions stroll in New York's 'park in the sky'". BBC News (Video). Sternbergh, Adam (April 29, 2007). "The High Line: It Brings Good Things to Life". New York. Zambelli, Matteo; Alves, Henrique Pessoa (2012). La High Line di New York. Milano: Mimesis. ISBN 978-88-575-0705-7. James Corner Field Operations, Diller Scofido and Renfro, The High Line - Foreseen Unforeseen, Phaidon, 2015. ISBN 978-0-7148-7100-4. Wikimedia Commons has media related to High Line (New York City).